So we had a little bond-market upheaval this morning. After President Trump successfully manipulated bond yields down yesterday and today by griping about the Fed’s rate hikes, an inveterate Fed dove (who has also been griping about the Fed rate hikes) responded by brushing him off, and suddenly all kinds of things happened, with the 10-year yield jumping and the yield curve steepening a tad within minutes. Within moments, the US Treasury 10-year yield rose from 2.85% to 2.89%. With the two-year yield at 2.59%, the “spread” between the two widened to a still minuscule 30 basis points, but that’s up from 24 basis points on July 17, which had been the narrowest spread since before the Financial Crisis. There is now a consensus that the yield curve must invert — that the two-year yield will rise above the 10-year yield — and that this yield-curve inversion is necessarily a predictor of a coming recession, and some think it will even cause a recession. But markets have a way of blowing this type of consensus out of the water. How does this compare to the government bond “markets” in other major economies – particularly in Japan, Germany, and China? First things first: “Market” in quotes because there really is no market in the sense that real price discovery is taking place, in the era of zero-interest-rate policies, negative-interest-rate policies, QE, stealth QE (China), and QQE (Japan). For instance, in the Japanese government bond market, the second largest in the world, the amount of bonds outstanding has ballooned. But a large portion is held by the Bank of Japan and government-controlled entities, such as the Post Bank and the Government Pension and Investment Fund, and there are days when not a single 10-year JGB is traded. This “market” has been purposefully put to death by the BOJ. The BOJ’s short-term interest-rate target is a negative -0.1%. In September 2016, in terms of its QQE bond-buying program, it introduced “Yield Curve Control” – a policy that targets yields along the entire yield curve, and not just short-term yields. This is something no other central bank has tried before. The stated purpose is to keep the 10-year yield near and above 0%. This policy now has some peculiar effects [Bank of Japan Takes Away Punch Bowl, Balance Sheet Declines]. The ECB first ventured into negative interest rate policy (NIRP) in June 2014 and then pushed deeper into it. Since March 2016, its “deposit facility” rate has been a negative -0.4%. It also embarked on an ambitious QE program. 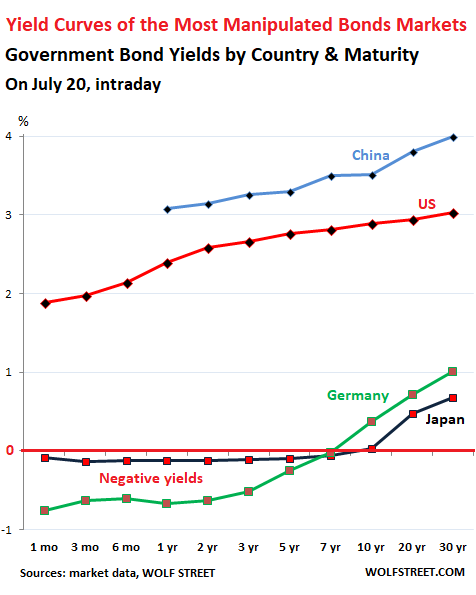 As a result, even for countries in iffy fiscal condition, such as Italy, short-term yields fell into the negative; and German yields are negative a good way up the yield curve. These phenomena would be totally inexplicable in normal times. By comparison, China’s government bond market is relatively sanguine, with higher yields, while the government has it hands full – via its state-owned and state-supported megabanks – keeping the corporate bond market from imploding unceremoniously. By comparison, the US yield curve doesn’t look so flat anymore. Japan’s yield curve is essentially flat from the one-month yield through the 10-year yield — a spread of 5 basis points, compared to the US spread of 101 basis points. The BOJ has proven that a central bank can engineer a flat yield curve purposefully without allowing it to invert. Now every central bank has learned from this experiment and knows how to do it. Japan has had the benefit of more or less real price stability over the past two decades, so inflation-adjusted yields are not in the deepest punishment basement. That cannot be said for German yields. Germany’s yield curve is the most negative among Eurozone countries. Yet, Germany’s consumer price inflation in June was 2.1%. Yields adjusted for inflation are deeply negative all the way up the yield curve to 30 years. No rational investor would subject themselves to this punishment. But there is forced buying by pension funds, life insurance companies (part of the private-sector pension system), bond funds, and other entities that have to buy German government bonds no matter what. They – or rather their beneficiaries whose money this is – are “gradually” bleeding, every day until maturity. ← What’s Going on in Trucking and Rail? You can argue over what it means, the combination of policy overlay, raising rates domestically, while the rest of the central banks remain loose(r) and the pressure on the EM to dump US denominated bonds into the market or even the IMF backstopping US bonds in Argentina. Can the yield curve invert in a falling rate environment? Shouldn’t we control the issuance of US bonds outside our border? 2016 was the market crash that never happened, the flood of QE around the world kept it out. – The US yield curve was flattning at a too rapid pace in recent weeks. So a bit of steepening/a pull back was not “unsurprising”. It could be the 1st step of the long awaited turn to steepening of the yield curve. In that regard we’ll have to wait and see. – Although there are some signs (no, no details) that seem (!!!) to suggest that the US economy and the US credit markets are about to take a turn for the worst. And those signs/indicators were more bullish in 2016 and 2017. Again, another matter of “Wait and See”. – I can’t comment on what’s happening in Germany & China because my information for those topics has “too many holes”. – NIRP for anything else than “cash” is the result of forces in the markets (a.k.a. Mr. Market). And as some Chinese philosopher once said, dig a hole deep enough, and everyone will want to jump in. I personally think the US yield curve is really a game of chicken between the Fed and a combination of flight to safety investors and manipulators with printing presses, with help from algos who game the interest rate futures just like they do equities. The Fed wants normalized rates – not too high and not too low as both are bad. The other team wants free money to churn so they can launder the profits using asset bubbles. Please toss in some cheap labor, too. The Fed will win. Then the springy thing under long rates will uncoil rapidly. The other places will invert if some goof over there decides it should. Trump is pulling his own inner Erdogan. He is now complaining about the Feds increasing rates. That’s of course after he claimed credit for the economy. Of course most people believe the fake recovery is all based on fabricated data. Trump put Powell in charge because that is what his (now fired) advisors told him to do. Trump knows nothing about the Fed, how they operate or what they do, he slept walked through his first appointments not knowing he would need these guys to pay for his big government and enormous deficit spending policies and his pro-inflation policy. You can bet his final Fed appointment will be Larry (spend, spend, spend) Kudlow. Government spending is now growing at an alarming rate. The military budget is growing faster then during the Regan era – are we readying for war? If so, what are we warring over? Resources? We have more then 5000 nuclear weapons, who dares attack us? Which is the greater deterrent, one nuclear tipped ICBM or one nuclear powered aircraft carrier? The 64 Trillion (Quadrillion?) dollar question is when will the Fed reverse policy and resume QE and will this policy reversal create a panic and a currency crisis. There is a reason we refer to the last round of QE as “QE3”, the reason is there were two previous rounds of QE and each time the Fed told us the QE was temporary and finite, yet they keep going back to the well for another drink. We were told that the second round of QE was one last injection needed to get us through, yet sure as morning sunrise we got a third round bigger then the first two – are we to believe that the Fed is all done with QE? The world wide loose money policy, unleashed by Bernanke, has flooded the globe with cheap, easy money. There are still trillions sitting in accounts, earning zero interest, and getting decimated by inflation. At the government’s official inflation rate of 2.9% (widely accepted as under-reported) my modest lifetime accumulation of wealth would be losing $70 per day, to inflation, if left sitting in a bank account – that is a painfully large tax that Bernanke forced on savers. For most people nearing retirement, and afraid to gamble in the markets, Bernanke’s inflation tax is by far their largest expense. I believe the next time the Fed reverses policy and goes back to massive money printing, to pay for deficit spending and keep assets inflated, they will create the spark to light the dry tinder of enormous, dormant currency and set off a conflagration of currency panic. Everyone rushing to quickly unload their currency before it loses anymore purchasing power will unleash massive inflation with too much currency chasing too few assets or even consumer goods. This is our fate and Powell is playing with fire as he fiddles with his occasional 1/4 point increase as Rome burns. Forget about Draghi and Kuroda they made the decision to destroy their currencies long ago – people only accept Euros out of habit – habits change. Not a fan of the Fed here, but Bernanke did face a crisis and he acted. Yellen did not face a crisis. How many rate changes during her tenure? Gutless puppet. And you find fault with steady 1/4 point increases? Good grief. Isn’t it obvious? He would create the biggest short position in history and raise rates 10% overnight. There was no crisis when Bernanke implemented QE3 – that was money printing with no other purpose than to inflate assets and 90% of assets are held buy 15% of the population. Bernanke enriched wealthy investors at the expense of conservative savers nearing retirement. Your statement has no connection to reality. Powell fiddles with 1/4 point increments as Rome burns because large increments would burn Rome faster than it is already burning. Gradual incremental increases are prescribed due to the volatility that large increases would undoubtedly bring. Bottom line is that the FED has flooded the Western empire of banking & corporate Oligopolies with dirt cheap credit & debt because they don’t have the slightest clue how to engage a reset worldwide. Mean Reversion will have to be the taskmaster here IMHO. Mean Reversion has to be about 50% of the stock market too, eh. Many people do not understand the REAL significance of yield curves: When the yield curve compresses, bank lending becomes less profitable. The gap between the yield banks pay on deposits and what the banks earn on loans becomes smaller. If the the yield curve does an outright inversion between 1-3 mo rates and 5-10Y rates, banks will stop lending altogether. Inverted yield curve means no credit. No more credit means recession. Everyone knows that without an ever increasing debt, the “economy” will fall into recession. But, assume the yield curve is a contrivance caused by manipulators who hate the idea of normalized rates. In this case, the inversion would be something that requires great cost and effort to maintain. If the Fed backed down, it would be worth it. If the Fed didn’t back down, the fake inversion would be a costly and very temporary event. Like a game of chicken. I just want to add this: banks are all over credit cards, essentially pushing them on people. They’re hugely profitable regardless of what the yield curve is. Rates can go over 30% even when the central bank rate is negative. Plus, banks also make money when people pay off their credit cards every month (and therefore do not pay interest) since banks get a percentage for each transaction. Most consumer loan rates are dependent on market forces (competition by other lenders). When profitability thins too much, lenders stop cutting rates. This is the case with car loans, mortgage rates, etc. Japanese banks are nicely profitable though the yield curve is essentially flat up to 10 years. An inversion wouldn’t change anything. Business loans are similar. Banks will ensure that they make money or stop making loans at those low rates, and business that want and need loans will have to pay more — thus ensuring the profit of the banks. Despite the very flat yield curve right now in the US, banks are having one of their best quarters ever. And lending is booming. Good point. Credit card ending will be nominally profitable even if the yield curve is flat. Mortgage lending, though, may not. And business lending may not. So the consumers with the credit card debt may lose their job and then banks will have big losses/writeoffs on the credit cards. The wealth mirage of the housing market will disappear. So in the end banks will take losses and reduce lending. Interesting comment on yield curves, but I wonder if that applies to how banks actually lend. Most people and main Street businesses dont get to borrow for free in any environment. The banks are allowed to charge 20% APR on credit cards if they want regardless of ZIRP. If the yield curve inverts, is seems like that is a bond-trading phenomenon that has little to do with actual lending. I tend to think inverted yield curves are irrelevant today – they can help predict a recession when they reflect real market rates, but I don’t think negative yield curves necessarily cause recessions themselves. When the rates are manipulated by central banks, they can no longer reliably predict anything. So, you believe it is people’s savings that banks are lending? That is hilarious. Even my young niece knows the money that banks lend (all but a tiny fraction) is just typed into an account. Banks don’t need your savings on deposit and could care less what you do with the electronic bits in your account – that’s why they pay you zero for your deposit, your account is worth nothing to them. Go ahead and pull your money out and see if they give a damn – they don’t. An INDIVIDUAL bank cannot lend funds that it doesn’t have. Its sources of funds are equity, deposits, bonds, interbank loans, etc. This rumor that an individual bank can just create money and lend it out is nonsense. However, the banking system AS A WHOLE, in a complex manner that involves deposits and price increases of the collateral is creating (and destroying) money. 1. Why do banks pay interest — in many cases now over 2% — to attract deposits? 2. Why do banks issue bonds and preferred stock to raise money? 3. Why is one of the most important measures of a bank’s performance its average cost of funding? Every bank discloses this number in its financials. “The Federal Reserve requires banks and other depository institutions to hold a minimum level of reserves against their liabilities. Currently, the marginal reserve requirement equals 10 percent of a bank’s demand and checking deposits” Fractional reserve banking. ten percent – the other 90% they loan out is simply typed into the borrowers account, it is not money deposited by savers. The money is created and floods into the economy. If the borrower pays the money to someone who deposits it back into the banking system the money gets recycled. The money in our monetary system is mostly loaned into existence by the banking system. In answer to your point 1) above – banks largely do not pay any interest to depositors. My bank (BofA) pays me zero interest and they have told me if I don’t like it I can take my electronic monetary units and store them in a different computer database if I choose – but my electronic bits won’t earn anything anywhere else. BTW, I believe the reason the Fed fears crypto currency has nothing to do with fear of competition and everything to do with people started to question the nature of currency itself. The Fed knows if this knowledge becomes wide spread the loss of confidence in the currency will devastate the dollar. They said they wanted more inflation and more inflation they shall have. Sew the wind and reap the whirlwind. So what is a bank going to do with the 90% of the deposit that you put into the bank? Eat it? On the asset side: “cash” $100. This cash is to be lent out. On the liability side: “Deposit” $100. It owes you this money and might pay you interest on it (expense). The bank bundles your cash with cash from other deposits and lends it out. A loan is an asset on the bank’s books. So the asset “cash” is converted to the asset “loan,” and the balance sheet remains in balance. The bank obtains revenues from your erstwhile cash via the interest it charges on that loan. The bank makes a profit by paying you less interest on the deposit (cost of funds) than it earns on the loan (revenues). This is why we say that the bank makes money by borrowing short term (deposits) and lending long term. But here is the thing: By the time you want to withdraw that $100 to pay bills, the bank has lent it out, and this money is now financing a home purchase by someone else. The liability side of the bank still shows $100 deposit. But the “cash” was turned into a “loan,” and so the bank cannot undo the loan to pay you back your $100. The assumption is that only a small part of the customers at any one time want to withdraw money. So banks have to have a certain amount of cash from deposits on hand or on reserve (at a central bank) to make it possible for customers to withdraw money. If all customers suddenly want all their money back, you have a “run on the bank,” and the bank collapses. (If a bank could create money out of nothing, there would never be a bank collapse, ever, by definition). Nicely said. Few seem to get it. But in fact, a bank can’t loan out more cash than it has on hand. In fact, it needs to keep a reserve on hand to facilitate everyday transactions and to pay out on loans already made but not withdrawn yet (the deposits made out of thin air, ha ha). Deposits and loans to the bank are sources of cash. Both are liabilities. You can’t loan out a liability. As a counterpoint, the cash on hand is used to make loans to customers. And, for those who didn’t read this well, banks can both make loans and borrow. Technically, a deposit is a loan from a customer to the bank. Banks can also raise cash by borrowing cash from someone else in a more formal loan arrangement. Plus, cash comes from equity and retained profits. Most, if not all bank conspiracy theorists confuse deposits with cash and assume deposits ‘made out of thin air’ are the same as cash in the system and that the bank happily loans out deposits, as opposed to cash. This is also why nobody wants everyone to try to withdraw all their cash at the same time … lots of it is out on loans. My god, are you serious?! Your SIGNATURE on a loan document results in the electronic CREATION in your bank account of the funds you have committed to repay. From THIN AIR. I thought WR had laid to rest these bizarre rants against ‘fractional reserve banking’ but apparently not. So let’s try a different tack. If you have a prob with FRB, pray tell us what kind of banking you DO want. In other words, describe for us NON fractional- reserve banking. This by definition would be a bank that does not have a mere fraction of deposits on hand, it has ALL of them. Not 10 percent, 100 percent. One advantage: there could never be a run on a such a bank, or not one where anyone loses money. One disadvantage: it could never make a loan of any money on deposit, because then it would only have a fraction on hand. But could it lend just its own equity, not deposits? Sure. A sufficiently rich person or group (the dreaded ‘company’) could just lend their own money. Probably the closest thing to this existing now are shadow banks, including mafia- type lending, where the collateral is the borrower’s life, or at least limb. The other end of the private loan biz is loans from the rich to very secure investments, i.e, not most borrowers. The vast majority would never get a mortgage. This is ‘banking’ before modern banking. A desire to return to NON-FRB is a desire to shrink banking to the point where it doesn’t exist in a way of use to a modern economy. PS: as one whose only asset is a modest amount of cash, I’m also fed up with the interest paid on deposits. But that is another topic, and has more to do with non- traditional government than traditional banks. I wouldn´t like to leave these questions unanswered. Banks monetize assets (ours) by issuing “new money”. But in order to do so they need a demand. If there´s no demand there´s no new money creation. Thus, they cannot “mint” new money by themselves: they need a second party. Look to my question below. Banks work in reverse to all other actors in that their assets are our liabilities, and our liabilities their assets. The central bank sets the policy of “reserves” (whatever they want that to be) to credit. That´s politics, and economics is politics. As they´re “independent” they can do as they please. If they want to use mortgages as reserves they could do it. Go and tell them what you see wrong with that. 1-They pay you an interest because they have a liability to you. They want your money because they´re required by the CB to have “reserves”. 2-They issue bonds for the same reason they want your money: they are required to hold “reserves”. If they deem stock issuing more interesting than “deposits” or bonds to get cash, they go for it. 3-Cash is a commodity and it´s priced by the market. If banks are required to hold cash “reserves” it´s natural to consider how much acquiring that cash costs them. 1- Search keywords: barclays qatar fine. “The charges relate to financial assistance Barclays Bank plc gave to Qatar Holding between 1 October and 30 November 2008, which was in the form of a $3bn loan for the purpose of directly or indirectly acquiring shares in Barclays plc.” How do you explain that loan? why not use the cash to get themselves out of their mess? 2- Search keywords: popular bank run. All said, thank you for such fine quality articles. We have to add “chain of banks” into this simple model. Deposit 100$ in bank-A, and banks-A lends out 90$ to bank-B, bank-B lends out 81$ to bank-C, bank-C lends out 72$ to bank-D, so on and so forth. So 100$ creates 90+81+72+63+…… worth of loans. Is this called creating money from thin air? I do NOT thinks so, but it does mean the total loan amount in the system is much larger than the deposit. Now let’s add central bank and shadow banks (think of quicken loans, who’s funding source is NOT deposit but money market). Shadow banks borrows money from short term money market (fed funds, repos, commercial papers). Think of the money market as the deposit source for shadow banks. Central banks Open Market Operation directly buy and sell in money market. Central banks CAN create money out of thin air and it is shown on their balance sheet. Shadow banks borrow from money market which is controlled by central banks and then lend out to capital market. Although the central banks controls the money market, you can NOT say all funds in money market is created out of thin air. Even when ZIRP and QE is in force, and central banks keep printing, you have to track whether those currency units created out of nothing has actually been injected into money market and released by shadow banks. I do think when the chips are downn where heads may roll or political/financial pressure is up, banks DO NOT NEED depositor’s money to lend. Central banks can create from thin air and become funding source. That’s certainly how it seems to work here in the UK. The BoE has even published a .pdf explaining it. Have just found this article, it seems to say things work more or less the same in the US. I think Wolf disagrees with my, and PositiveMoney’s and others, interpretation of the .pdf, unfortunately I cannot find a reference to his objections. However, this doesn’t mean banks can lend willy-nilly. There are restraints, such as capital ratios, but the majority of the money you and I get our mitts on is produced by private banks. You’ll have to DuckDuckGo “PositiveMoney” as I don’t want to risk having this post removed for embedding too many links in it. You need to read the ENTIRE paper of the BOE and NOT just the title. The paper makes a HUGE difference between an individual bank and the banking system as a whole. And it also says that within this banking system AS A WHOLE, money creation involves DEPOSITS not loans. This is a complex paper, and not many people read it. But lots of people who haven’t read it cite it to prove a point that the paper doesn’t make. As I stated above, an INDIVIDUAL bank cannot lend money it doesn’t have and cannot “create” money. However, the banking system AS A WHOLE creates (and destroys) money in a complex dynamic process. That’s what the BOE also says, and it’s trying to figure out and explain how that process works. They need deposits to start lending. Deposit is the first step for the circular flow of money to generate $100 from a $10 deposit. They will if all pull their money out at the same time. If they don’t they may not exist to give a damn! I’m surprised by the arguments about how our 10% fractional reserve banking system works. This seems pretty fundamental. Do we have a banker in the house that could clear that up for us? GSH, I’m a licensed CPA. I accurately described simple basic bank accounting above. It’s really that simple. There is a two tier economy, one where the yield curve is suppressed to support the interest of the elites, and another where it doesn’t apply. In Deplorableland people don’t have mortgages, they pay rent at over 50% of take home pay, yield curve does not apply. Car loans at 24%, not on the yield curve. Credit cards at 30%, not on the yield curve. Personal loans at 40%, not on the yield curve. Deplorables don’t have savings, they have overdraft fees, not on the yield curve……Do we care about the shape of the yield curve, nope. Deplorable Debtors also have some cash in the bank, for the most part, so I think they SHOULD care about the shape (and absolute numbers) of the (especially) lower end of the yield curve. Consumers should care about the Treasury Yield Curve. Right now I am getting better interest rates in 4-week T-bills than I do on just about any savings account*, and I don’t have to open multiple savings accounts to stay below the FDIC limit. Banks hate it when deposit rates rise and lending rates are stagnant, that’s my point about margin compression again. (*) “Marcus by Goldman Sachs” is at 1.80%, and InvestorsBank is at 1.90% today. Last week 4-week T-bill auction was 1.909% (APY assuming reinvested whole year). It is not just a coincidence thatthe best savings accounts are close to the T-Bills. Banks are having to compete, to some extent. Ugh, the (%) was supposed to be (*), a reference to the (*) further down. PTB (powers that be) feel free to edit. The PTB fixed it for ya! Do you honestly think someone just getting by will put away $1K to get $18 at the end of a year and pay taxes on it too. They will keep the money handy for the next emergency. I guess it depends on exactly how deplorable the polite society thinks that someone is! Whatever. You’re still earning less then inflation on your “savings” and that’s before the government takes their cut – good luck with that strategy. Interest rate hikes are most likely over. The president will appoint most of the Federal Reserve board members, and they can control whether the district bank members who disagree with them are allowed to sit on the Federal Open Market Committee only if the Fed board allows it. The bankers, and therefore the president, all want the cheap money gravy train to continue, and all restrictions on the banks to go away. But the key reason that the president probably wants to keep cheap rates is the federal deficit. The ballooning federal government deficit will become so much more expensive as the interest rates go up, that it will become increasingly difficult to finance. The only way that I believe that interest rates will go up is when the foreigners begin to demand higher interest rates to take U.S. paper. So far that hasn’t been a big problem, but the nascent trade war could have an effect on their willingness (or need) to continue to buy U.S. paper. Indeed, think Wolf himself pointed out a while ago that 4 out of 5 seats on the BOG of the FRB are still empty. So, yeah, if the FRB is disobedient, the President could nominate and appoint some obedient BOG members and take control of the FOMC actions that way. Perhaps this very fact is the main reason that BOG has been unfilled for years now: So that appointments can be made, as needed, to influence monetary policy. I think he’s learning fundamental international econ 101 the hard way. In his previous life, low rates were all he needed to understand. In his current life, it’s all about international flows and relationships. There’s no such thing as bad or good from dollar strength or weakness. Plus, higher rates here add lots of interest income to the domestic economy, causing big economic growth. He doesn’t grasp this yet, apparently. My weak currency means low imports from you to me and more exports from me to you. My stuff is cheap. Your stuff is expensive. We get your currency that we have to get rid of to turn into real money. My strong currency means more imports from you to me and fewer exports from me to you. My stuff is expensive. Your stuff is cheap. You get dollars that are not real money to you. If I buy more from you with my strong currency, then you end up with dollars that must be repatriated to the US since your economy does not uses dollars as your local currency. In one sense, toilet paper is more useful and more valuable until it’s repatriated. High interest rates = strong currency because capital is in flight to higher rates for a better return. People need dollars to invest in the higher rates in the US. We don’t take euros or anything else here. Demand for dollars = a strong dollar. The old problem: Dollar repatriation was used to inflate asset values such as Chinese mandarins buying real estate in Canada or the US for any price. The solution: capital controls on dollar repatriation so that it is steered towards investment that creates jobs and not asset bubbles. Not complicated. It’s that simple. You have lots of dollars … build a factory in the US or use them for fireplace tinder. Your choice. Someone please tell 45 about this brief econ 101 lesson. Otherwise, he’s doing great. >>capital controls on dollar repatriation so that it is steered towards investment that creates jobs and not asset bubbles. Has been said a few times before; The foreign profits had already been repatriated and were in USD-denominated assets for a long time. The profits could not be spent domestically without paying taxes first, though. And that is where the Trump Tax Cut (TTC?) came in. I wasn’t referring to profits held overseas. I honestly don’t care about that. I was referring to, for example, dollars in China earned from selling us cheap goods. A dollar is useless to someone in China since they don’t use dollars in China. Repatriation should entail job creation, not real estate asset bubbles. good lesson. What are the chances he reads wolfstreet comments? Your ideas of capital controls reek of protectionism usually employed by tinpot dictatorships. The world has changed…the US is no longer the centre of the universe, those USd, traded on the global market can be used in any number of high yielding destination markets that will fight each other for the privilege . Trump is doomed. “Disobedient” works, but so would “disloyal” and “unprofitable”. “Ethical” and “principled” would also work, if we weren’t talking about the Fed. Would you have any ideas about how much of a “campaign contribution” it might take to reverse or prevent the imposition of certain tariffs? I’m feeling frisky today. Drain the BOG! Whoops, someone else already did that. Okay, then. Fill the BOG! With cronies! Too late. Trump wasted 4 of his 5 appointments while he was asleep at that wheel. Of course the guys he appointed are all easy money guys but there are easy money guys and eeeeeeeeeeeeeeeeeeeasy money guys – Trump would have wanted the later to pay for all the treats he likes to hand out (provided he’s not paying for the treats). This is Trump’s diabolical strength: a few tweets, a few comments here and there, and the whole financial world, supposedly run by people with inside knowledge, overreacts exactly the way the President and his closest advisors want. No need for changing fiscal policies or lengthy confirmation hearings for the new Fed members. These comments were all aimed at creating some momentary weakness in the dollar, most likely to see how China’s economic leadership would react to it. The offshore yuan (CNH), meaning the value of the yuan on international markets the People’s Bank of China cannot directly control and which directly affects import/export prices, has been going lower and lower for weeks now. While this has been attributed to China’s present internal economic turmoil, there exists the strong possibility this is a purposeful devaluation to incentivate Chinese exports and reduce the effect of tariffs on Chinese goods. The PBOC has done this before. By sending the US dollar somewhat lower with a few comments (remember that currencies move relatively slow because currency markets are massive), the Trump Administration is teasing the Chinese leadership into action. If they are devaluing the CNH, they are bound to react one way. If they are just busy kicking the can in their own capital markets a little longer, they are bound to react in another. Either way the Chinese leadership is in a tight spot and will have to do something, anything, because so far they have been taken for a ride. Just because other countries similar to ours also have flat yield curves does not mean we are okay. If anything, in the era of global trade, this signals even more risk with respect to the economy, not only of ours alone, but of many others. Who will bail all of us out? Of course, one can only speculate about how much a bright Goldman guy like Mnuchin profits from these executive manipulations, as one could easily surmise that personal profit is their real purpose. Truly, it just seems rather unrealistic to suppose he was hired to be an agent of some altruistic social good. Raising interest rates tightens the monetary supply, which chokes down the credit supply. At the exact moment that governments and giant corporations need new loans to pay the interest on the old loans! US Sovereign Bonds (aka) Treasuries, trade based on inflation expectations. When inflation is higher so are treasury bond yields. When bond yields rise, bond prices fall. When bond prices fall, the bond bubble blows up. When the bond bubble blows, the everything bubble blows up. Now you’re getting me depressed Got Gold? I only studied econ. 101 and 102 in college, but reading of the BOJ as first of other central banks to implement “yield curve control,” is nothing but a euphemism for gaming the system…And everyone I have known–myself included–to game the” system,” eventually ended up with a big bite taken from their a$$…. According to Professor Richard Werner The Fed is reacting to the economy and certainly not leading it. He thinks their plan is to have centralised control by eleminating smaller banks with these policies and introduce silos of block chain to consolidate their power. He erroneously believes the FED isn’t proactive but cause always precedes effect and that’s how we got to where we are today. Next stop is to ban all Chinese products. They can devalue their currency all they want. In that case iconic brands might have fewer duty-free products available to import and slap their labels on. Good idea. Just don’t forget to add in those Chinese rare earth products the US doesn’t produce any more, cell phones, electronics, clothes, ……. :-) (high speed trains) Pax jets next? Bye bye Boeing. Where would we get the touch screens we need to operate our military equipment. Can’t switch back to buttons either, those are also imported. If we want to keep expanding our military we’re gonna need to import the components from China and we sure seem to want to expand that military – one thing all Americans agree on: mil-tarry spendin dun biz gr8. If we want to go to war with China we are going to have to buy the components from them. How many touch screens and flat panels made in the U.S. – zero. The yield curve is a “curve” of interest rates for debt certificates. The interest rates for more distant maturities are normally higher the further out in time. The reasons why the yield curve rarely inverts are simple: there is always price inflation in the United States. What does an inverted yield curve indicate? This: the expected end of a period of high monetary inflation by the central bank, which had lowered short-term interest rates because of a greater supply of newly created funds to borrow. This monetary inflation has misallocated capital: business expansion that was not justified by the actual supply of loanable capital (savings), but which businessmen thought was justified because of the artificially low rate of interest (central bank money). Now the truth becomes apparent in the debt markets. Businesses will have to cut back on their expansion because of rising short-term rates: a liquidity shortage. They will begin to sustain losses. The yield curve therefore inverts in advance. An inverted yield curve is therefore produced by fear: business borrowers’ fears of not being able to finish their on-line capital construction projects and lenders’ fears of a recession, with its falling interest rates and a falling stock market. An inverted yield curve normally signals a recession, which begins about six months later. The stock market usually begins to fall six months prior to any recession. So, the appearance of an inverted yield curve normally is followed very shortly by a falling stock market. Fact: The inverted yield curve is an anomaly, happens rarely, and is almost always followed by a recession. Interesting how these central banks have people wondering whether they will inflate the debt away through money printing. They think it makes people spend, but all it does is create hyper uncertainty that makes people save even more. Only the wreckless debtors will spend in that environment, leading to quick defaults. I’ve reached the conclusion central bankers are idiots that blow and pop bubbles. dear wolf– why can’t the feds follow instead of lead. if 10, 20 and 30 year yields creep up because of market forces, then the fed can slowly follow with small increases in the short end every quarter or so. problem is with yields so low the pension funds are all going belly up as their bond ladders have been destroyed, and those funds involve trillions of dollars [fed, state, local]. If all the Fed did is follow, there would be no reason to have the Fed. It’s the Fed’s job to lead. The Taylor Rule implies both “following,” as well as abolishing. Critics say we’d have no tools to get out of a 2008-type situation. Others would say that no tools would have been preferable. Luckily, as humans, we have no solutions, and will be able to talk about our follies forever. Not to put too fine a point on it, Bullard is FOS. The mandate he operates on is to keep interest rates the banks that own the Fed pay to savers as close to zero as possible. As for inflation the joker pretends not to notice that the Mustang that cost $4,000 in 1975 now costs $40,000, or the Ford F-150 pickup, the same price then is $70,000 today. Thx for another good write. I’m looking forward to the day discussion of bull-flattener vs bear-flattener occurs. An Individual, say I1, deposits $10 in Bank A. Now assume Bank A loans $9 to a company, C1 next day. So technically if Individual I1 asks for his $10 day after that, Bank A will be insolvent simply because it does not have the money. Like this it goes on. If you add up it will be $100. This is it. This optics is used by the Fed for money circulation. While technically Bank has not printed or created any money, the Fed by its 10% fractional reserve banking system helps things along making it legal. In addition the Fed stands by with the printing press to bail out the banks should all the loans be in default and I1 and C1 to C10 ask their money back. The Fed does this by putting the savers, prudent people, retirees under the bus. In addition if this does not suffice, the tax-payers will be made to pony up without a by-your-leave. Another tarp so banks can bailout the Fed by way of Congress? (We are the world and everyone is the dollar) 10 trillion dollars in tarp with promises of flat tax and end of fractional banking? Who is a lay person supposed to believe? This is his very own theory that contradicts nearly everything else. Everyone can make up their own theory. It sure is fun. But enjoy with a grain of salt. He is way out there with his other theories too. Government bonds are owned by the central bank and as excess reserves are time stamped? The wealthy doesnt want their interest income to go away and the central bank wants these reserves to disappear before they are spent? Long paper as corporate governance saves the rest of government? 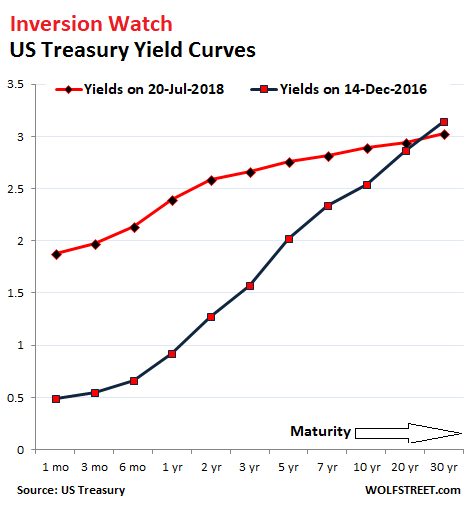 – Has the yield curve finally turned to steepening (again) ? I finally think it has ……………………….. So the point of the article is that the U.S. can kick this can for another 3 decades? Flattening the yield curve like Japan has done without inverting it will somehow save the bond market from a downturn? There are a lot of people saving in dollars. If the US goes this route they risk a credit crunch and it’ll be 2008 all over again. Who wants to save in the debt of a dead market? Not the private sector. And what about all the hype surrounding unfunded liabilities? Will “forced buying by pension funds…” continue as they bleed from every orifice while also losing “every day until maturity”? Forgive me if I cant see the light at the end of the tunnel. Thank you very much for the article. It is interesting.